All versions require SecuROM and Games for Windows - LIVE DRM. [Note 1] SecuROM has 5 activations per month. GFWL can be disabled with Fable III GFWL Remover. DLCs are no longer available for purchase. Download the patcher from this page. Extract the contents of the downloaded archive to a temporary working folder with at least 4 GB of space available. Move "Levels.bnk" and "Levels.bnk.dat" from "Fable 3's Data" folder to the "Source" folder in the above temporary working folder. Double-click on the "Run Me.bat" file and wait for the patching to finish. Open the "Output" folder and move the contents into your "<path-to-game>\Data" folder and overwrite the existing files. Keep the contents of the "Source" folder somewhere safe just in case you want to revert the changes my patcher made. Make a backup of <path-to-game>\data\levels.bnk and <path-to-game>\data\levels.bnk.dat in case something goes wrong. Download the Fable 3 BNK Browser from this site. Download the blank BINK file from here. Create a temporary working folder on a storage device with at least 4GB of free space. Extract the contents of the two archives you downloaded earlier into your working folder. Create two copies of the blank BINK file and rename them to lionhead_logo.bik and microsoft_logo.bik. Create an empty folder in your working folder to hold the contents of one of the game's resource packs. Open BnkBrowser.exe then click on Open. Navigate to <path-to-game>\data\ and open levels.bnk. Click on Extract All then select the folder you created in Step 7. Exit BnkBrowser when the extraction is finished. Open the folder you created in Step 7 then navigate to art\videos\. Move the two blank BINK files created in Step 6 into this folder and overwrite the originals. Open BnkCreator.exe then click on Add folder(s). Select the folder you created in Step 7. Click on Create then navigate to <path-to-game>\data\. Select levels.bnk then click on Save. Run the game to test that it starts without issue. After that, you may delete the temporary working folder. Temporal anti-aliasing controlled by Effects Detail setting. No individual option. Caps the frame rate at half the refresh rate. See Force Vsync for proper Vsync. Multi-monitor resolutions cannot be chosen in-game. Changing video settings in-game may reset the resolution; repeat these steps if that happens. Choose your resolution and save your changes. Set your resolution and save your changes. Games for Windows - LIVE should be disabled if its anti-cheat protection is crashing the game. See Bypass Games for Windows - LIVE and apply the fix. Download the Fable III Cheat Table. Start the game and load a saved game. Check the box beside "FOV [F2]". Switch to the game and then back to Cheat Engine. Check the box beside "FOV". Double-click in the FOV Value column and change the value. Toggling off the fix (F2) during cutscenes is recommended. Mouse wheel and some special keys can't be remapped. A previous issue relating to Steam running out of keys for the game has now been resolved. The game remains unavailable to buy, but copies obtained via unused gifts or codes from third party retailers will now activate without issue. However, many people are still reporting that they're unable to use or activate the game's DLC. There has been no official response to this issue. Game Settings - Controls / Audio / Misc won't save for some users. Game Settings - Display are saved to %APPDATA%\Lionhead Studios\Fable 3\VideoOptions.xml, which could mean it's possible to create .xml files for the other settings. Open the Fable III profile from the list. Set Prefered Refreshrate to Highest available. Apply changes and close the program. Using Alt+Tab ↹ may cause a delay when switching between the game and Windows. Alternatively, playing the game in windowed mode will use the desktop's refresh rate. Benefits include faster loading and saving times. 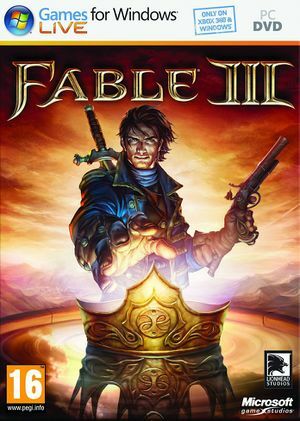 Download Fable III GFWL remover. Check readme.txt for useful information. ↑ 2.0 2.1 File/folder structure within this directory reflects the path(s) listed for Windows and/or Steam game data (use Wine regedit to access Windows registry paths). Games with Steam Cloud support may store data in ~/.steam/steam/userdata/<user-id>/105400/ in addition to or instead of this directory. The app ID (105400) may differ in some cases. Treat backslashes as forward slashes. See the glossary page for details.